Are you prepared for a natural disaster? Do you have a plan that includes your pets? Seems no matter how much we think we are prepared, nature has a way of letting us know that we aren't. I am a BlogPaws Conference Sponsored Blogger on behalf of Hill’s Pet Nutrition® and Hill’s Food, Shelter,& Love®. I am being compensated to help share information about Hill’s Pet Nutrition and the Hill’s Food, Shelter, Love initiative with my readers and fellow Influencers, Neither Hill’s Pet Nutrition or BlogPaws are responsible for the content of this article. Take for instance a few months ago when ma and a friend were test driving a car. It was a beautiful day but within a few minutes the storm clouds came in and they brought hail with them. It was so bad that ma had to pull over and her and her friend were both praying the windows didn't break in the car. Luckily they didn't. But with this hail came torrential rain. Rain like neither of them had ever seen. The roads quickly flooded making it hard to get home. Ma was worried sick about us. We were home alone. 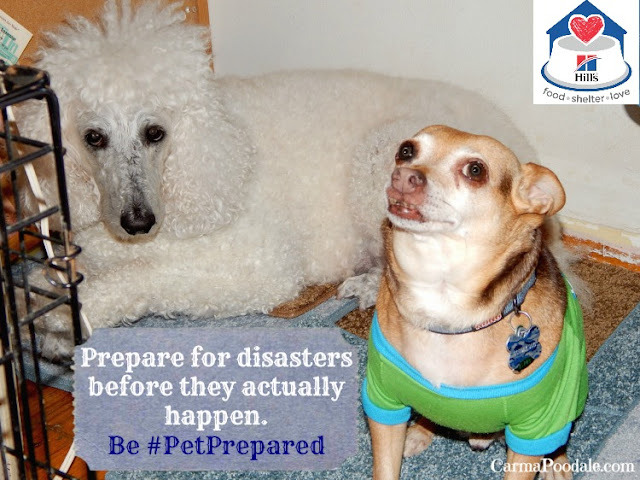 It made her rethink her secure feeling of being #PetPrepared for emergencies. Her plan was thought out. The only thing was she thought she would be with us when disaster struck. In a few minutes, nature told her that may not always be the case. We are so honored to be sponsored by Hill’s Food, Shelter & Love® to attend the 2017 BlogPaws conference in Myrtle Beach, SC! In recognition of the risk that pets face during natural disasters, the Federal Emergency Management Agency (FEMA) has established May 13, 2017, as National Animal Disaster Preparedness Day. Hill’s Pet Nutrition® is joining with its nation-wide network of animal shelter partners to encourage pet parents to include their pets in their family emergency planning. If you are not home or are not able to get your pets out with you, your local shelters will step in to take the animals in. The responsibility for shelters during a disaster stretches already overwhelmed staff and resources to the breaking point, as they are not just caring for shelter animals, but also pets that have become separated from their owners. Hill’s Disaster Relief Network is poised and ready to help at a moment’s notice so that they can ensure that all of the animals, though stressed and upset, have proper nutrition to keep them healthy until they can be reunited with their owners. Even the most prepared owners can get separated from their pet and it is important to have a plan in place that ensures the health and safety of your pet in times of crisis. <- It happened to us, it can happen to YOU! 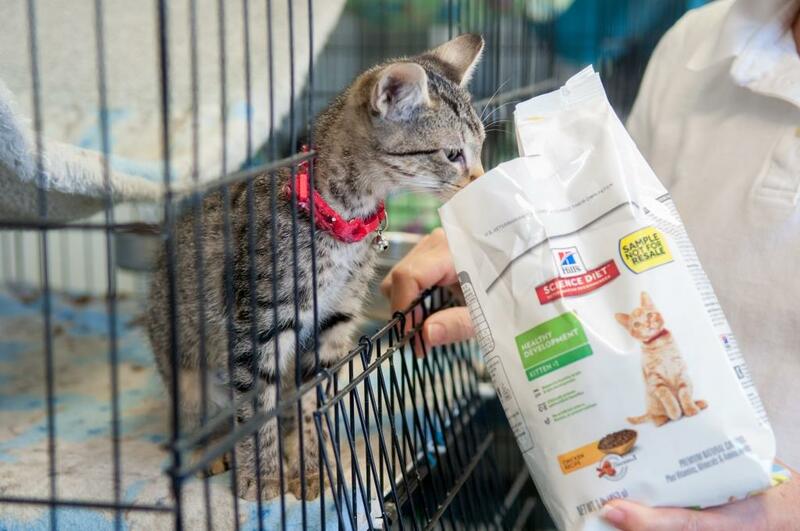 The most recent was the severe flooding in Louisiana, where Hill's Pet donated 75,000 pounds of free pet food! Hill's came in with over 75,000 lbs of pet food to support the pets and people in Louisiana affected by the massive flooding last year. The food was distributed through Louisiana SPCA, one of the wonderful shelter partners in the Hill's Food, Shelter & Love program. 1. Ensure your pet can be identified by either a microchip or collar ID tag and that contact information is up-to-date. These items are important to ensure you can make it through a disaster until help can arrive. It's a small chore to put it all together but can make a huge difference in how you handle your emergency. If you are attending the conference, we would love for you to stop by their booth. If you are not attending, stay tuned because we will be sharing a lot of updates and talking to the Hill's Pet representative!!! After the conference I will be sharing more ways to be #petprepared. I want YOU to be prepared. Do you have an emergency kit for your pets?? I am honored to be sponsored! I am excited to see you and thanks for letting us know about Hill's Pet and their disaster preparation. I have had to evacuate a few times, so I know how important this is.